Vintage, Inc.does one or two major projects at a time, depending on their size. Once we start your job, you can count on a consistent and steady progress toward completion. 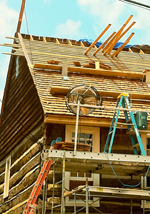 Restoration, building renovation, historic preservation and period carpentry are all creative, brainstorming tasks. We particularly enjoy and welcome the chance to work with others in our field, such as architects and historians. We welcome input, and enjoy the team spirit that is often present when "carpentry research" is underway. We can handle large and complex renovation/restoration projects. 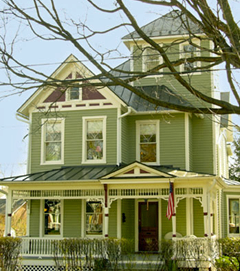 Vintage, Inc.,based in Winchester, Virginia, was born out of a love for old buildings and a passion for fine quality and traditional craftsmanship. Over the past decade and a half, we have had the great pleasure of completing approximately 45 major construction contracts, and hundreds of smaller historic preservation jobs. We particularly enjoy challenging and complex projects. We take what we have learned from working on countless historic buildings, paying attention to the details that made these buildings long lasting, and integrate this into all of our renovation and construction. Materials are a big part of their success, workmanship is another, and the design and thoughtful execution make a large contribution. Historical preservation of all materials we use and their incorporation in an old building is always seamless and compatible. Vintage, Inc. has also expanded our offerings into traditionally detailed kitchen cabinetry, windows, furniture, traditional canvas strainers, and shutters. We serve homeowners, churches, museums, and the hospitality industry.